Ever since the movie, Goldfinger, the third installment of the James Bond film series, British automaker Aston Martin has been so closely associated with cinema’s most famous superspy. With few exceptions, such as the tine in the 90s where BMW was his preferred car, every actor to play Bond has not been without an Aston Martin. Current James Bond, actor Daniel Craig even owns his very own Aston Martin Vanquish. Of course…he’s about to let it go for charity. Craig’s Vanquish is none other than one of 100 Vanquish Centenary Edition built commemorating the 100th anniversary of Aston Martin. And it also happens to have the serial number of 007, the fictional superspy’s own agent code. Craig is saying goodbye to the car for a Christie’s charity auction. Meanwhile the proceeds will go to The Opportunity Network, a New York-based charity who focuses on helping disadvantaged students achieve their education and career goals. Contrary to how other trades have reported, Crag’s car isn’t specifically one that was used in a James Bond film. Instead it is the Centenary Edition. However, that doesn’t make it any less unique. When Aston Martin celebrated 100 years in the business, they added many unique and special touches beyond pretty solid sterling silver Aston Martin badges or silver thread embroidery in the interior or even just individually numbered silver sill plaques. The anniversary edition came with a whole box of goodies that from two glass keys with custom bespoke key pouches made from the same leather as the car’s interior. Drivers could be extra stylish with silver Aston Martin cufflinks and even carry an exclusive silver pen, and a silver polishing cloth for all of that silver. Fancy ain’t it? Back when the 100th anniversary was being celebrated, Aston Martin actually staged several big events to mark the occasion. That included 100 examples each of the V-8 Vantage, the DB9, the Vanquish, and the Rapide, to be known as Centenary editions. While most of the changes were purely cosmetic the colors and variations were exclusive to these editions because the formula Aston Martin came up with takes a total of 18 more hours to the car’s already tense 50-hour painting time. The color they’ve come to call “Skyfall Silver” (after James Bond’s country manor) actually gradually reveals a progression into a darker and wider strip of charcoal until arriving at the base of the windshield. Like Craig’s personal car, in certain lights, the color scheme gives off a midnight blue look. 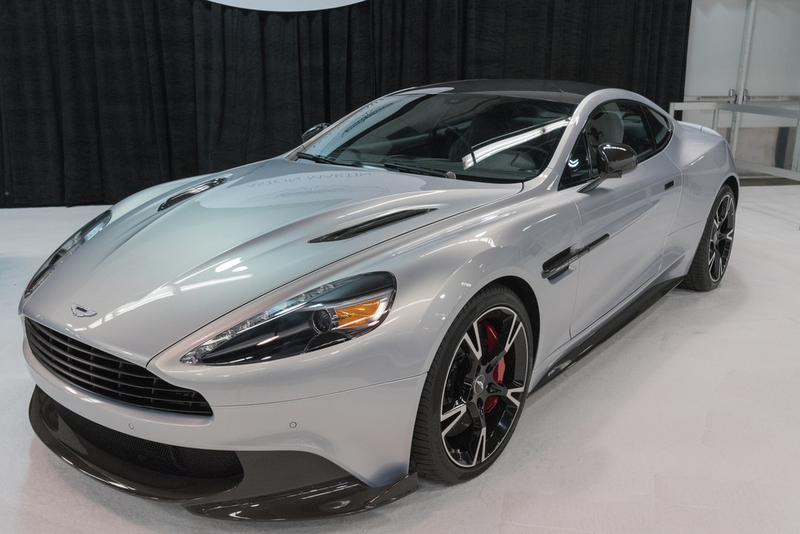 If you get behind the wheel of Daniel Crag’s Aston Martin or any Vanquish, you’ll be gifted with the power of 6.0-liter V-12 engine with a six-speed automatic transmission at your fingertips. The Vanquish can push out 565-horsepower with over 457 pound-feet of torque. If you do the math that means the car hits a top speed of 183 mph. While Craig never drove a Vanquish in a Bond film, his predecessor Pierce Brosnan did in the 2002 film Die Another Day and we got to see it in a ludicrous car chase with a heavily armed Jaguar XKR. Keep in mind that this British car is left-hand drive and the bidding starts between $400,000-$600,000. License to kill not included.